Keith Farmer talks to PaddockChatter ahead of his debut BSB season. ﻿ British Superbike rookie Keith Farmer has had an almost fairy-tale start to his road racing career. Having won the National Superstock 600 title at his first attempt in 2011, he backed up immediately by taking the hotly contested National Superstock 1000 in 2012 completing an unprecedented back-to-back championship run in the process and so underlining his mantle as one of the hottest young properties on the British racing scene. After a successful junior career in Motocross and Supermoto before embarking on his impressive track exploits, the Paul Bird Motorsport rider is about to undertake on his biggest season yet as Shane Byrne’s team-mate in the PBM Rapid Solicitors Kawasaki team contesting the 2013 British Superbike Championship. We caught up with the fast Northern Irishman to find out more about his background and his thoughts on the coming season. You come from a successful road racing family, where did it all start for you and who were your early inspirations? Racing began for me when my late uncles Mark and Stephen passed away. I was only five so don’t really remember much but I remember more of Stephen than I do of Mark as he was always up at our house working on bikes during week and was always a happy, smiley and fun loving fella. I think that’s where I got a lot of my inspiration from as he always wanted to win, and no matter if he won he always wanted to improve and that’s exactly the way I am in my approach to racing. I started racing motocross at age of 8 for 8 years, I then changed to racing Supermoto but never fully settled and always wanted to go further forward and test myself more and more. In 2010 my dad bought me my first track bike, a Yamaha R6, which I did a handful of races on in Northern Ireland and it all kicked off from there really, I’ve never looked back. Was it expected from an early age that you’d become a motorcycle racer or did you explore other sports too? As a kid I have always grew up on and around bikes. I started riding an LT50 at the age of 2 and then got my first 2-wheeler at age of 4, nothing like starting young. Racing is in our family’s blood and always will be, I did play football and rugby through school but only for fun, as racing is unconditionally where my heart is. 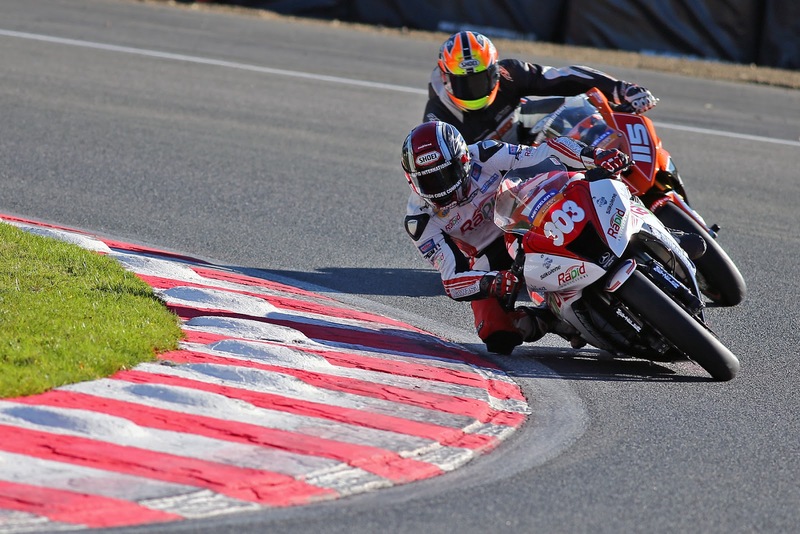 Your rise through the ranks has been nothing short of meteoric, can you remember how you felt when you arrived at Brands ahead of that maiden 2011 STK600 season and what you hoped to achieve? Going into Brands Hatch’s first round in 2011 on the STK600, I was very nervous to be honest as everything was new to me. I had a new style of riding to learn, a new track and a whole line up of riders that, apart from 2, I didn’t know. I was going into the season thinking that if we could score points and gradually get top tens in the latter part of the season, then we would have been more than happy to say the least. We couldn’t have predicted the outcome would turn out to be as good as it could get. You won the championship that year, beating last season’s Supersport Cup Champion and fellow Northern Irishman Glen Irwin in to second place. At what point did you think ‘I can win this’ and how did you deal with that realisation? It was absolutely a tough class, all the bikes were pretty much the same so left it down to rider ability and who wanted it the most, I can say hand on heart that no one wanted to win more than me, I wanted to keep moving up through the classes as quickly as I could as I knew I had started road racing late on compared to some of the other riders in the class. Even after I had the four victories in a row, I never once thought for a second “it was in the bag” as I know a lot can happen, so I concentrated on consistency, scoring points and keeping the pressure on the other riders to try and beat me. When I realised the championship was becoming a reality was the 2nd race at Donington Park when Conor Beehan crashed. I saw it all unfold in front of me, I knew than that all I needed to do was finish 6th or higher, which on paper should have been a quite easy ask but as is sometimes the case, I felt pressured and made mistake after mistake, but thankfully I brought it home with 2 rounds to go, what a big relief!! It was after title that win that Paul Bird showed a big interest in you and signed you to ride for him in the hotly-contested National STK1000 series for 2012. Talk us through how you approached that season as part of high profile team and what the expectations were. When I met Paul Bird for first time it was through my manager Darran Gawley, it was just after my first race win at Oulton Park. After the race he said he was impressed with what he’d seen and last time he seen someone as special was when he had Casey Stoner ride for him, the biggest compliment I’ve ever received, and it was at that point he said he wanted me to ride a STK1000 for him in 2012. When I started riding for Paul, I put myself under more pressure than anyone else as the big team set-up was all new to me. The PR from it all, plus my two team mates who where known all over the racing world, Shane Byrne and Stuart Easton, really opened my eyes to the step I’d taken. Paul had never said he was expecting results from me so that was good to hear, I didn’t know how I was going take the transfer to the bigger bike but obviously wanted to shine as quickly as possible to repay a little of the faith Paul had shown in me. Thankfully the first round at Brands Hatch was wet and it actually broke me in nicely and gave me the confidence I needed to push from the next round at Thruxton. You’re following in the footsteps of former British Champions Steve Hislop, Stuart Easton and current champion Shane Byrne as part of the experienced Paul Bird Motorsport team. How is PBM helping to prepare you for the challenge of a full British Superbike season? I cannot thank Paul enough for everything he has done for me already. Everyone will see it that he prepares a bike for me, just as he does for Shakey, and I get to go out and ride it as hard as I can, but in my case he is putting a lot more into me than that. I have a wee girl Sophie aged 22 months back at home and I get to see her every Saturday as Paul flies me in to Cumbria on Monday morning for personal training and to make sure I’m on a strict diet and not doing anything silly to hurt myself on a Motocross bike for instance, so I train five days a week and then I fly home Friday night to see my little girl. I’m really thankful to Paul for the time he puts in to me but not only that, I stay at his home, which has been really cool. Not only is he my boss, but he’s like a pal to me as he trusts me to respect his space and home. It’s a very fortunate position to be in. You rode the Superbike in anger at Brands Hatch during the final round of BSB last October, what were your initial feelings the first time you rode the ZX-10R? The first time I ever rode the ZX10-R was on a track day at Cadwell Park in 2011 while I was contesting for the STK600 Championship. I was doing a track day to get time on the bike before he got me an entry to the European STK1000 championship at Silverstone at the WSB round to give me some big bike experience before that race. The bike was an absolutely handful compared to what I was used to as the only road bike I had ridden was my Yamaha R6! It took a good part of the year getting used to the different riding style from a 600 to a 1000 but I am getting my bearings of it now! Is it a massively different bike to ride compared to your STK1000? Yeah there are a lot of differences between STK bike and superbike, on the superbike you have better brakes, suspension and chassis but biggest difference is the tyres, that’s the least easiest thing to get my head around. Not only do you have those to contend with, but the fact that with all these differences, you have to find all your new braking markers because you carry so much more corner speed so obviously brake later and get on throttle earlier, so it messed with my head a little when I rode the superbike and superstock bike same weekend at Oulton Park. What have you learnt from your STK600 and STK1000 wins that will benefit you going in to 2013? I have learnt a lot, and I mean a LOT, over these past 2 years, but the biggest thing I have learnt is not to rush the race. Through 2011 and most of 2012 I always got sucked into trying too hard too early wanting to lead, yes sometimes it worked but in the longer races you have to be patient and let the race come to you. This year I need to be thinking of saving tyre wear for the end of the race, not to mention thinking and no doubt re-thinking my strategy through the race. Tyre wear is probably the biggest thing as it worked so well for me at the last round of 2012 when I was as far back as 7th during the race and still came through, with a little patience, and won the race from PJ Jacobsen…although I would’ve preferred a bigger gap! The new home-based test schedule for 2013 should really benefit you with invaluable track time on circuits you’ll visit on the calender, that must give you a confidence boost? Yeah it’s definitely a confidence boost from that point of view for more track time on the tracks I’ll be racing on, but as there’s not many track days in place before the start of the season I would have liked to gone abroad for more time to get used to the superbike. Another factor for riding in UK is, it could be snowing knowing our climate, so there is potential the weather could leave us short on track time. What are your goals for 2013? Is the showdown a realistic target or is it more towards learning this year, with the showdown as a bonus, ahead of a full assault next year? My goals this year are pretty much same as they are any year, to go out enjoy myself and do what I love doing. A happy rider is a fast rider, as Paul well knows! Yes I want to score well and ideally top 10 is where we are aiming but that Showdown is exactly where it’s at. I personally want to be in there so we can mix it up at end of year when we have learnt how to ride a superbike properly, but no matter what happens I’m going to be learning all the way through as I have the best team possible behind me, along with the championship winning bike and rider alongside me! I just want make myself, my team and my family proud where ever I end up come September. I can’t wait for the season to start!